In a recent Canton drunk driving accident, a driver was injured and was also issued a summons for driving under the influence of alcohol. It wasn’t just his blood alcohol concentration (BAC) that led officers to bust the driver. It was also because he crashed his pickup truck right into a house on Washington Street. The accident happened early Saturday morning, according to Wicked Local. Local firefighters had to extract the driver from the building and from the vehicle just after 3:00 a.m. According to the Canton Fire Department, paramedics were on site treating the unconscious man inside of the truck. Once he was freed, he was flown to Mass General Hospital. He is expected to make it. Local and state police are still investigating the accident. A crane was eventually called to the scene of the accident to remove the pickup from the wreckage of the building. Our Canton drunk driving car accident lawyers understand the risks of being involved in a drunk driving car accident are about four times higher during the evening hours than during the daytime. In addition to you being at higher risks during the evening, you’re also facing greater risks when traveling on the weekend. In 2010, about 31 percent of all drivers involved in a fatal accident on the weekend were under the influence of alcohol. This is in comparison to the 16 percent involved during the weekdays, according to the National Highway Traffic Safety Administration (NHTSA). In the state of Massachusetts, there were more than 140 killed in car accidents that involved a driver who was under the influence of alcohol in 2010. These kinds of accidents don’t have to happen. They are completely preventable. Still, we continue to lose the lives of thousands every year because of these thoughtless acts. Drivers are asked to be safe and responsible out there and to completely avoid driving if you’ve had anything to drink. There’s a father in Ludlow who is trying to bring these accident risks down. He’s sending a strong message to drivers. He’s displaying a vehicle that his son was in when he was involved in a drunk driving car accident. According to WWLP, the man’s son was drunk when he slammed head on into a car that was also being driven by another drunk driver. His son looks like he’s going to be okay, but he says that this was an experience that he wishes upon no parent. “If I can save some kids life this weekend that’s what this is about,” said the Ludlow father. 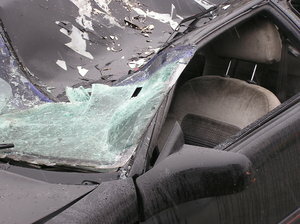 During this time of the year, drunk driving car accidents are common. Kids are back in school and they’re using their weekends to get out and party. Make sure your kid’s weekend plans don not involve drinking and driving. And the best way to help ensure that is to set a good example.